We are thrilled to introduce a new blog series, Finding Houdini, from guest curator David London! David will be sharing his adventures as he tracks down the exciting ephemara, daring details, and fascinating facts on who some might call America’s Greatest Magician: Harry Houdini. In July, while performing at Baltimore’s annual Artscape Festival, I unwittingly called Marvin Pinkert on stage to help assist a piece of magic. At the time I didn’t know that it was Marvin, or that he led the Jewish Museum of Maryland, but the trick worked, people were fooled and entertained, and we all went about our merry ways. That was less than two months ago today, and neither Marvin nor I could have imagined where we would find ourselves today. A week after that show, I received an email from Marvin titled simply “Houdini exhibit”. He was inspired, and I was intrigued. Emails turned to phone calls. Phone calls turned to meetings. And meetings turned into a vision: Inescapable: The Life and Legacy of Harry Houdini coming to the Jewish Museum of Maryland in Summer 2018. Aside from the lofty claim itself, I find myself particularly fascinated with the phrase “this or any other age,” for the most amazing thing Houdini ever accomplished was to become the most famous magician and escape artist of all time, who to this day, over 90 years after his death, is still synonymous with magic. But despite being known around the world, few people know his incredible story of transformation from Erik Weisz, Hungarian-born son of a rabbi, to Harry Houdini, the Master Mystifier. Born in Budapest in 1874, just 9 years after the end of the American Civil War, and uniquely balanced between two centuries, the first 26 years of Houdini’s life were the final 26 years of the 19th Century. Houdini found himself uniquely positioned at a critical time of transformation, innovation, and radical progress in America and the world. 1874 to 1900 saw the invention of film, radio, wireless communication, the incandescent light bulb, the internal combustion engine, and skyscrapers. These first 26 years of Houdini’s life also saw endless hardship and struggle, which Houdini combatted with big dreams and sheer determination. Houdini’s early career, from changing his name to Harry Houdini in 1891 to signing a contract with the Orpheum Vaudeville Circuit in 1899, is both a fascinating and often overlooked period in the Houdini story. Trying to make ends meet, Houdini took every gig he could, jumping from town to town, hoping for his big break, while attempting to realize his calling be a professional magician. At this time in his career, Houdini touched many of the most critical constructs in early American popular entertainment and spectacle– circus, sideshows, dime museums, medicine shows, the 1893 World’s Fair in Chicago, and finally vaudeville. When he “hit the big time,” Houdini needed the world as much as the world needed him. As a symbol of freedom and self-liberation, and after years of trying to make ends meet, Houdini became a worldwide sensation on a scale which we will never see again. I have been tasked with bringing Houdini back to Maryland. I say back, as Houdini made at least 7 appearances in Maryland in the early 20th Century including at least five appearances right here in Baltimore. 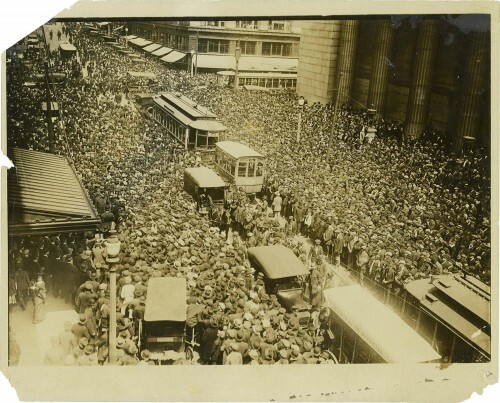 In the amazing photo below, courtesy of Fred Pittella’s Houdini and Escape Museum, a crowd of over 50,000 gathers on Charles Street in Baltimore on April 26, 1916, to witness Houdini escape from a straitjacket while suspended high above. 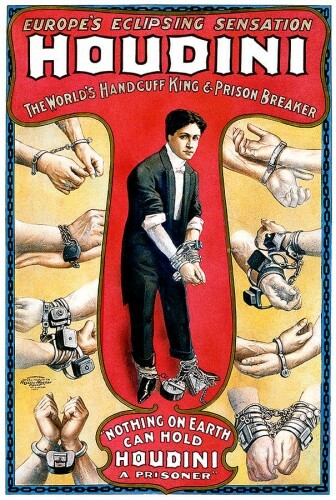 Image courtesy of Fred Pittella’s Houdini and Escape Museum. At various times in his career, from 1905 – 1917, Houdini performed at The Maryland Theater in Baltimore, a now defunct 2,000 seat vaudeville house on Franklin Street. In 1925, he kicked off his world tour at The Maryland Theatre in Cumberland, MD, certainly not knowing at the time that it would be his final tour. In order to bring Houdini back to Maryland, I must first find him. Aside from inside the hearts, minds, and imaginations of his beloved fans both past and present, where does one go looking for the legend himself? Countless biographies, newspaper clippings, photographs, and personal accounts help paint the picture. The story becomes more clear while digging through private and public collections of Houdini items across the country. On this blog, I will document my adventures as I embark on my quest of Finding Houdini, and bringing him to the Jewish Museum of Maryland. Ate you looking for Houdini items to loan? Thanks for asking – I believe our curator David is still on the hunt for some items! Please send him an email at drnodnol@gmail.com. What is the best way to send photos of the authentic H.H. items? Hi Daniel – please contact our Director of Collections Joanna Church at jchurch@jewishmuseummd.org. Thanks!